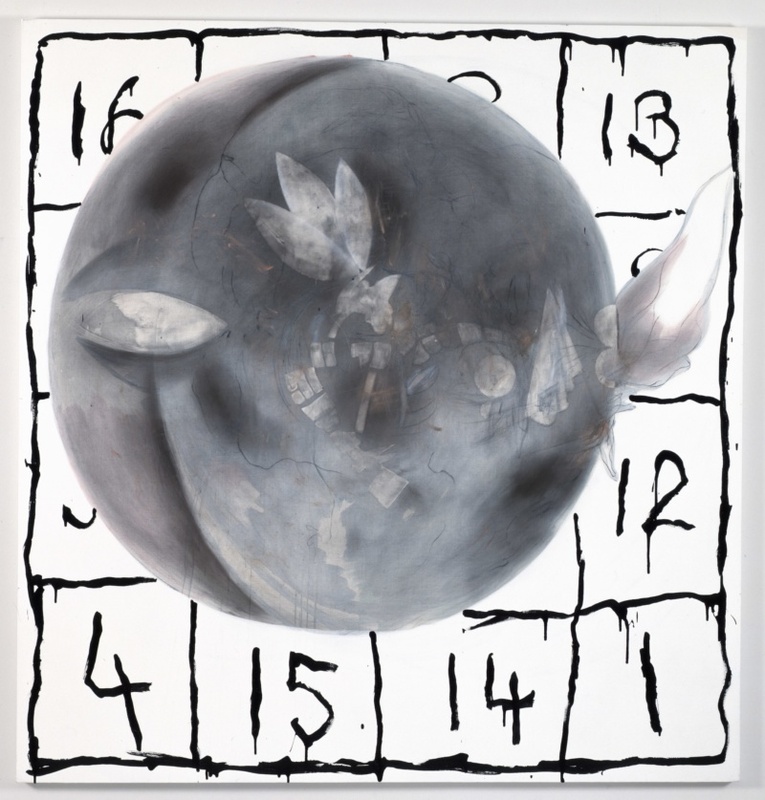 Within moments of arriving at “Snake Eyes,” Charline von Heyl’s retrospective at the Hirshhorn, a guard asked me if I knew the secret to Melencolia (2008), a painting divided into numbered squares, many of which are blocked by a large, orb-ish mass. Every row and column had to add up to 34, he said. “Do you want to know the numbers that you can’t see?” he asked me. “I’ve been looking at it for a while, so I figured it out.” He told me and I immediately forgot. I wanted to ask the guard what those numbers meant for him, literally hidden and yet illuminated: if they helped to pass the time, if he imagined away the globe in the center of the painting in order to place each numeral in its logically required square, which seemed to me a madness. Of course, madness is Melencolia’s gray moon, the primordial and almost Chagall-ish vortex hearkening back to Dürer’s etching of the same name and the bad luck of black bile. An artist wants to conjure the spirit and finds that they have tools only to measure that desire. It turns out that my feelings are structured a lot like von Heyl’s paintings. The distances they articulate between images, icons, and forms help me understand emotional distance and the contours of moods. I see their hard and soft irregularities, the gazes they articulate through attitude, their declarative weirdness, their absolutely clear diversions, and I recognize these as features of my interior world. Feelings announce themselves to me and then scurry away, leaving the imprint of outlines that I know well—exhilaration, coyness, rage, confusion—and they loiter ineffably, layering in clouds that have at best tenuous, tangential relationships to the scenes playing out in the world before my eyes. Compare this to the frontal line comprising bowling pins and a long-necked bottle that dominates the compositions of Dunesday (2016) and Plato’s Pharmacy (2015), which hang adjacent in the exhibition. I recognize these based on their outlines and the variations of color and texture that hint at glass and the markings of pins. The objects are foregrounded and asserted as subjects, given that privileged “aboutness” in the paintings, and then set aside, almost, as I wonder what to do with them and what they have to do with their environment. My eye moves around them and beyond at the rest of the paintings’ surfaces, seeing a passage that resembles a green curtain among smoke and arrows, another an inverted, striped shadow-wave. No matter, the pins and bottle continue to inform my looking, a reminder to take aim at something. They announce themselves in my brain whenever my eye passes them over, like an alarm whose buzzing re-positions me in time and my to-do list: don’t get lost in gesture; remember that a painting can be something until it isn’t anymore, at the edge of an outline; time to try to make sense of it all. There are other instances where recognizable forms emerge from proximity and von Heyl’s wit. Take Killersmile (2011), whose eponymous gesture rearranges stripes that look like wallpaper or tepid modernism, pulling an emoticon-like smirk from a slash (albeit with astute nods; I saw Daniel Buren, Charlotte Perkins Gilman via The Yellow Wallpaper, and the language of advertising). Or Carlotta (2013), where one eye and a mouth are able to make a woman’s face immediately recognizable. This signifying allows some snakey, painted-over marks to suggest hair, or a brain; half an oval of dots becomes half of the face in shadow; and some striated pinks and browns start to make folds under a chin. It does not fall into portrait or character—it is more like a mirage, preying on the human urge to find faces everywhere. Part of the drama is the brash presumption of this eye and mouth to reconfigure otherwise unrelated painted elements into their own pictorial agendas. Since I saw this painting at Petzel in 2013, this face has become my personal image of Charline von Heyl. In a recent interview with Jason Farago, she says, “It’s called Carlotta because, as a child, I always thought Carlotta was the coolest name on earth. 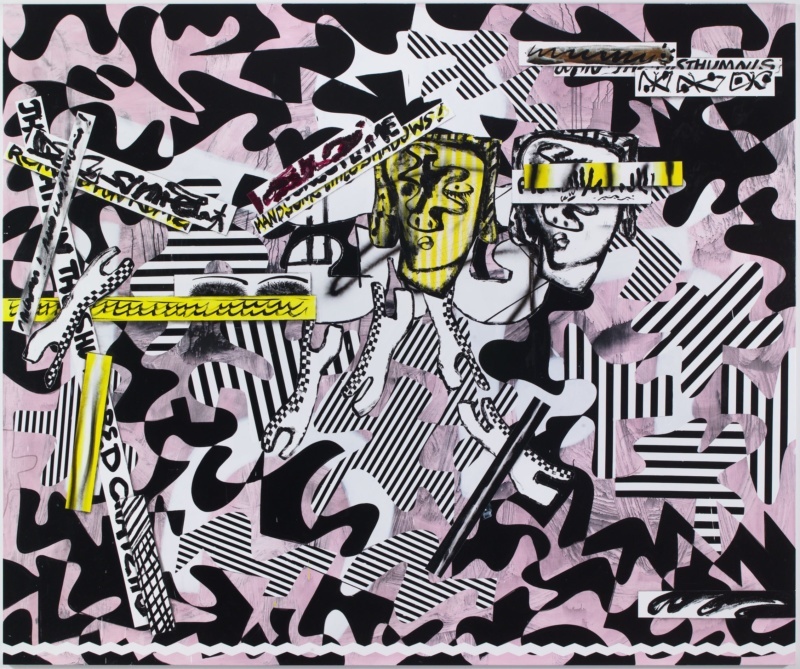 It’s my fetish object of a name, projected into the painting.” To wit: Carlotta is my fetish object of Charline von Heyl, projected into this essay. It is not irrelevant to my fetish that “Charline” and “Carlotta” are such close names, both variants on “Charles,” subjected to slightly different filters. I could squint and misrecognize the two, visually and etymologically, which cements the terms of my devotion and is validated by her propensity to pun in titles and imagery. Von Heyl plays as adeptly with manipulating experiences of genre and format as she does with forms and surfaces. The conditions of making meaning are, on every level, up for debate. Looking at the tubular shape in the center of Slow Tramp (2012), you might think of a vase, the sense of still life reinforced by stripes resembling wallpaper. Then, eyes drifting along its top edge, the painting shifts to a landscape with a wet, violet-gray sky and a winding black path. Neither of these experiences is denied by the painting. I see them as two-dimensional manifestations of a more complicated object, sides of a lenticular print that shifts with me when I move. As in a lenticular, I understand that whatever happens to be visible is purposefully incomplete. The image is completed in the mind. In Slow Tramp, this variability becomes content, as a relief from subject matter or a return to it. In their incessant articulation and erasure of things and moves we recognize, von Heyl’s paintings let us relinquish the false binaries that litter our thinking of representation, of which none is more repeated or insidious than its implied opposition to abstraction. Rather, the works suggest that the two describe different parts of the same process. Abstraction, as insinuated by its etymology, drags what is nameable away from its usual surfaces. Representations confront us with our distance from the things we think we already know precisely by reminding us of them. This is also like a lenticular. During my two-day visit to D.C. I saw “Snake Eyes” twice, with a visit to the National Gallery in between. They were not dissimilar experiences, but then, I was looking for connections. Wandering the halls of European painting in an unfamiliar museum, I was attentive to things I already knew: painters, genres, penitent Marys, sliced fruits. Wandering the rooms of “Snake Eyes” is comparable. I collected the appearance of various widths of marks, a particular acidic yellow, the presence and placement of a head, squiggly grids, straight-edged grids, large obstructions, etc.—as I tried to find the meaning in their repetition, the clues they might give me about the exhibition as a whole. 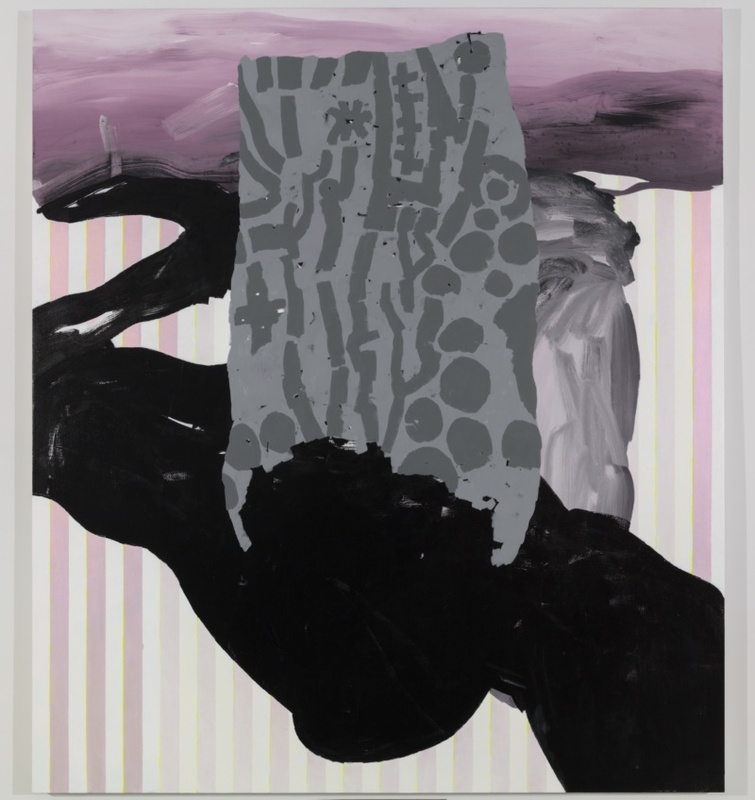 Von Heyl’s references are prodigious and generous, offering viewers ways of entering the work on their own terms. They also replicate the experience of seeing this language of symbols, colors, paint handling, and materiality as a code, a language spoken by and between paintings, interpreted but not spoken by people. Talking about painting can feel like pushing rocks from a mouth-shaped hole, like the one in Igitur (2008), a work I recognized on sight from reproductions in magazines and on the internet. It wasn’t the same at all: the red was immediately brighter and more spatially rebellious, the lavender background less atmospheric, moodier. I had for years thought of it as an abstract symbol, perhaps related to a stylized letter in an illuminated manuscript, but in its presence, I was certain the crimson shapes were lips glowing from the exertion of producing inscrutable, possibly meaningless lumps which nonetheless continuously tumbled out. In an interview in the show’s catalog, von Heyl says that paintings “are these weird looking-holes, time tunnels so to speak.” It’s true; I always look at paintings in my present, and a painting I am looking at always pre-exists my present, so there is a kind of time warp at work. Usually, we think of this as looking back, which is technically true. However, paintings (and, one can say, art objects in general), also represent the specific present of their making, both indexically, in having been made at a specific time, and metaphorically, in the sense that they are made in relation to their time. In this sense, looking at art produces an amalgamated present through a slip of tenses: the work was made in a present tense which, though having passed, is simultaneous with a present tense of its experience. In looking at any painting, five minutes or 500 years old, these two presents commingle. This way of thinking about viewership makes the idea of aspiring to total newness less important than being able to communicate being of one’s time, a high order. It’s an audacious gambit on the part of a painter, to convince a person to try to talk with an inanimate object. Language of the Underworld, 2017. Sometimes von Heyl’s paintings have the quality of a time tunnel laid bare on a surface, as in The Language of the Underworld (2017). The title reads like a wry take on the Death of Painting, which von Heyl has survived at least twice between Düsseldorf, where she began her career, and New York, where she moved and has had a studio since the mid-’90s. Just as wryly, with a nod to David Maurer’s linguistic study of crime circles, it suggests that being a painter requires the ability to code-switch between the underworld languages that are the parlance of painting and the genteel world of the living. Making paintings is always building Rome over Rome, the new and the old casting jumbled shadows impossible to untangle; moving forward inevitably because time does. These knotted shades are everywhere in von Heyl’s work, too sprawling to enumerate, built in as part of the paintings’ surfaces and their underlying communicative structure. Even the head in The Language of the Underworld looks translated via Dubuffet and Picasso, certainly gangsters themselves, equal parts classical ruin and cipher of subjectivity. 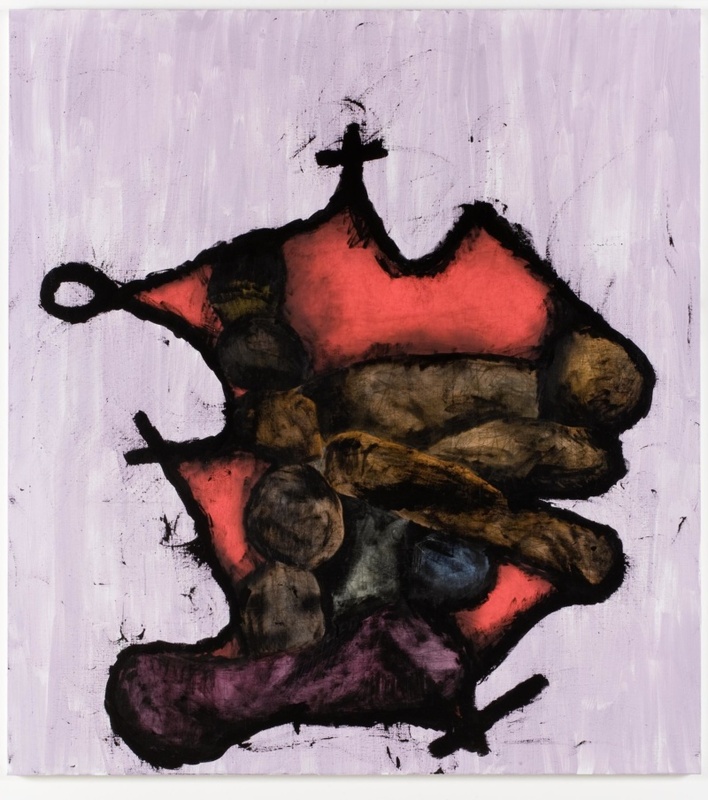 The paintings whisper as seductively and obscurely with the chatty forms of dead paintings as with us, the living, in front of them, and, in doing so, bring us all to the same plane, as though von Heyl has taken it upon herself to mediate the conversation, false idols, miscommunications and all. Show us how, Carlotta.